Did I tell you J and I went to see Seamus Heaney read as part of the country's celebration in honour of his 70th birthday hosted by the National Concert Hall? Well, we did! And 'twas lovely. We had fab seats, about five rows back two or three seats to his right. The concert hall has 360 degree seating, and he read a few poems to those behind. He selected many love poems--to his mother, his father, his wife, his friends, his writing. The reading seemed a tribute to love and friendship, to human connection. All I know is a door into the dark. Or hiss when a new shoe toughens in water. Where he expends himself in shape and music. To beat real iron out, to work the bellows. What a memorable night. 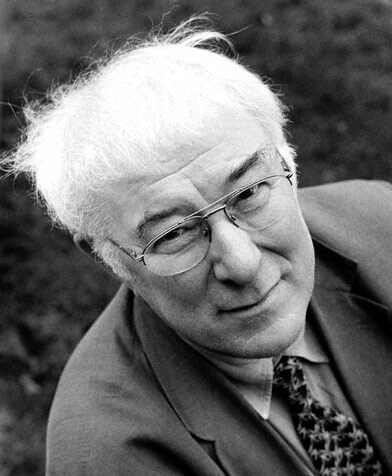 Heaney so down to earth, humane. So dawn and birth and not a show-man, not a bard in the big ego sense, though giver of a great show, sowing bearing of the big-ago sense. At the close, he left heaped in flowers and applause.